Forty years of Keser Israel unfold a glorious story of pioneering, struggle, service and finally triumphant fulfillment in the Cause of Judaism. The historian of Jewish New Haven has recorded it that in the late 90’s and the 1900’s a group of Jewish families settled in the Dixwell Avenue neighborhood. Before long, united by their faith in God, they laid aside differences in religious usage and established a small congregation which met at different homes for daily and Sabbath Services. Eventually they collected the funds wherewith they purchased the Synagogue on Foote Street. With the Synagogue building also came the Hebrew School. For many years the Keser Israel Family worshipped in this Synagogue, even while they prospered and most of them moved into more aristocratic neighborhoods. The family grew from 19 families to 350. By the time we hope to move into the new Temple on Chapel and Sherman Avenue [in 1950] we fully expect to be 400 strong. 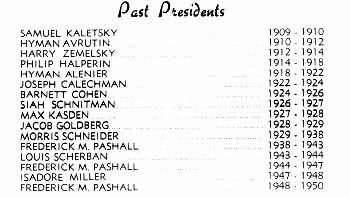 It is fitting to recall the devoted service which was given to the Synagogue during the so-called Foote Street years when the following gentlemen served one after another as presidents of Keser Israel: Samuel Kaletsky, Hyman Avrutin, Harry Zemelsky, Philip Halperin, Hyman Alenier, Joseph Calechman, Max Kasden, Jacob Goldberg. These have departed from this life in due course but their memory lingers on with us. Barnett Cohen, Siah Schnitman, Morris Schneider, also Presidents, are having the pleasure of seeing the evolution of Greater Keser Israel. There were others whom the Lord has thankfully spared for us. They have served us loyally and well. They have helped at all times to carry on the traditions of our congregation, and therefore we single them out for our appreciation: Samuel Halperin, our permanent volunteer-reader, Simon Millen, our Honorary Gabbai, Samuel Hershderfer, Morris Beloff, Harry Massey, Charles Golden, Joe Kugler, Harry Kimel, Max Zimmerman, David Mansfield, Joseph Orchowsky, Isaac Press, Morris Simon, Isadore Kruger, Hyman Ruttenberg, Louis Levert, Samuel Shermann, Harry Konick, Henry Horowitz, Joseph Feinstein, Samuel Weber, Maurice and Samuel Miller, Jacob Schneider, Joseph Goldman, Abraham Levine and Max B. Miller. Among the Ladies, pioneers and veterans, leaders and officers in our former Ladies’ [Auxiliary] now known as our Sisterhood, we choose to honor Anna Rubin, Rebecca Goldman, Mrs. Harry Kagan, Mrs. Bessie Miller, Mrs. F. M. Pashall, Mrs. Nathan Sosensky, Mrs. David Rosen, Mrs. Henry Galin, “Aunt” Scheitelman, Mrs. Rose Langer, Mrs. Joseph Feinstein, Mrs. George Miller, Mrs. Bessie Stephson, Mrs. Harry Kimel, and Mrs. Harry Diamond. May these good ladies be spared with us and for us many, many years and may have much joy of the future glory of Keser Israel. Within the past few years a New Era has come to Keser Israel. We launched the Foundation Fund with Herman Paul as Chairman, and then the Building Fund with Isadore Miller as Chairman, and finally the Expansion Fund with Nathan Sosensky as its Chairman. Louis Kasimer has valiantly served as the Financial Secretary of all these Funds. We sold the Foote Street Synagogue and purchased our Norton Street Congregational House which we resold very recently to Young Israel, a group of young orthodox Jewish men and women in the community, in order that our temporary Home may be continued as a Home of Jewish Worship and Torah. Men such as George Horwitz, Jack Levine, Abraham Gubin, Louis Scherban, Herman Hodes, Louis Kasimer and Martin Janow assisted actively in those transactions. Our religious and cultural activities kept apace with our financial progress. Under the leadership of our spiritual leader, Rabbi Leon Spitz, our Religious School expanded, we carried on a weekly broadcast “The Voice of the Synagogue” on WNHC, we published KIN monthly since 1941 with Mrs. F. Pashell serving as editor, following Louis Scherban. Our Sisterhood grew, our Men’s Club and our YPL made good progress. We confirmed our First Confirmation Class. Finally triumphant fulfillment came. We purchased the Plymouth Church on Chapel Street and Sherman Avenue to serve as our new Temple and Synagogue Center. 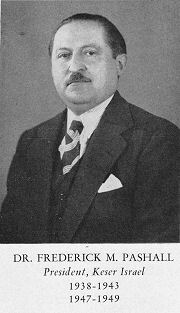 Louis Scherban and Goodwin D. Wolff assisted in the negotiations, Abraham Gubin, Samuel A. Smith and Louis Kasimir took over the heavy responsibility of the pew arrangements. Several of our families memorialized Windows and Classrooms in cherished memory of their departed ones. Martin Janow, David Ordansky, Milton Potash, Morris Oppenheim, Frank Teitelman, Jack Senderoff, president of our Men’s Club; Mitchell Garber, Jack Schneider were among those who came forward with their assistance. To mark the occasion of this transition to greater achievement we have published this 40th Anniversary Journal and we voice our appreciation to Chairman Moe Goldstein and his energetic associates: Samuel Garber, Al Weber, Isadore Miller, Morris Reinstein, Max B. Miller, Herman Paul, Maurice Schnitzer, Mrs. Al Cohen, Mrs. A. Stephson, Mrs. Abraham Gubin, Mrs. Ben G. Wise, and Mrs. Samuel Weber. May the Lord God of Israel privilege us all to participate in consecrating our new Temple next Fall in joy and in reverence.